Dan Brown continued his assault on religion and particularly on Christianity in a major way in ‘Origin.’ In fact the first half of the book is full of one attack after another on religion. Also according to first impressions, all of the bad characters seem to be religious while the ‘good’ folks are all atheists and agnostics. At least that is what it seemed like in the beginning. All of the answers to those questions coming out of religion are discounted. Particularly those coming from what Brown calls the ‘dark religions’ (like Christianity, Judaism, and Islam) who insist that the answers are contained within ancient scriptures like the Bible. The philosophical conclusion given in this book is that all religions will eventually fade away. But Brown’s protagonist Professor Langdon is not so sure. He still see a role for religion in helping science deal with ethical and moral issues. Then there is the question of first cause and origin of order. Supposedly Brown’s atheist/techno-scientist is killed because he is going to present scientific answers to where we came from and where we are going that will do away with religion once and for all. But his ballyhooed presentation is actually far from conclusive or even satisfying. A third issue comes up in the midst of the story. What about humanity’s relationship with technology and how will the evolution of AI affect our future? And finally, will some kind of controls and checks need to be placed upon Artificial Intelligence? 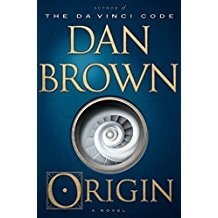 Dan Brown is known for turning out novels with frantic paced non-stop action that readers have a hard time putting down. ‘Origin’ continues that tradition for the first 3/4 or so then it slows down and becomes rather anti-climatic. There are major twists and turns at the finish line and some of the characters are really not at all like they seemed to be at the beginning but by then I really didn’t care all that much. I did find the Catalonian/Spanish locations, including the art and government references, as fascinating. I looked up all of the museums, churches, and buildings referenced in the book. Then I read articles on the Spanish government, the history of the Franco era, along with reports on the current Catalonian independence controversy. All of which added a new dimension to the story for me. ANSWERS For The Faith » Blog Archive » -Robot AI ‘god’ to Preach in Japanese Temple?